Founded over 150 years ago, Phi Psi boasts a rich history at many of the nation's top colleges and universities. 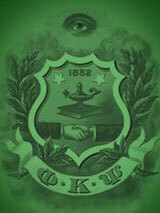 Calling a number of others to join them, a Brotherhood was founded on February 19, 1852. It flourished, and gradually extended to other colleges and universities throughout the country. Idealists all, these founders of Phi Kappa Psi taught a new fraternity - a Fraternity that would complement the work of the university by cultivating those humanities without which the educated man fails of his greatest usefulness. At the time of our founding, Jefferson College was considered one of the "Big Three" in what was known as the "Jeffersonian Cradle." The other two institutions comprising this group, Harvard and Princeton, were of very nearly equal size and equal high esteem. These institutions all graduated predominantly ministers, lawyers and physicians from an academic curricula based in classical literature, religious doctrine and basic sciences.